Allah, Who is Allah? Is the Muslim Allah the Devil? Is God and Allah the Same? Allah is the Arabic word for God (literally 'the God', as the initial "Al-" is the definite article). Throughout history, it has been used mainly by Muslims to refer to God in Islam, but also by Arab Christians, and often, albeit not exclusively, by Bahá'ís, Arabic-speakers, Indonesian, Malaysian and Maltese Christians, and Mizrahi Jews. Allah is the Muslim name for the Supreme Being. The term is a contraction of the Arabic al-llah, "the God." Both the idea and the word existed in pre-Islamic Arabian tradition, in which some evidence of a primitive monotheism can also be found. Although they recognized other, lesser gods, the pre-Islamic Arabs recognized Allah as the supreme "God". Self-professed Arab Christians often use this name -- Allah -- simply as a generic term "God". 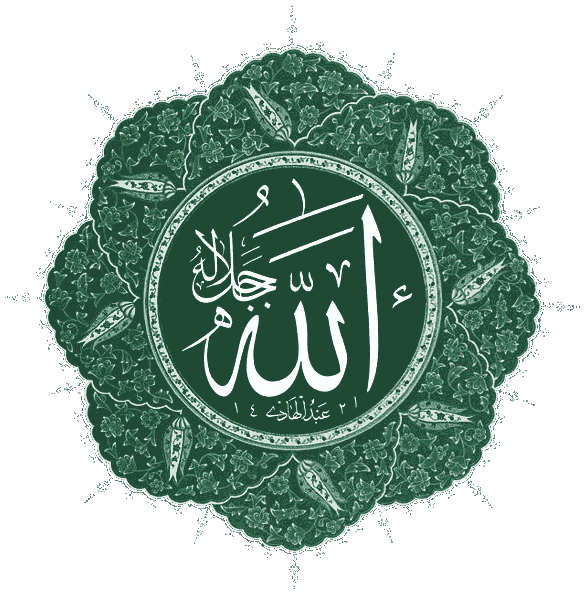 (The actual generic word for "God" is simply 'ilāh, though due to the strong association of Arabic with Islam this word is rarely used in modern speech.) Arab Christians do maintain a belief in the traditional Christian Trinity, however, and believe that Allah consists of the Father, Son and Spirit. The Qur'an, Quran or Koran, the "holy" book of Islam, asserts that Allah is the creator and the one who rewards and punishes; that he is unique and can only be one; that he is eternal, omniscient, omnipotent, and all-merciful. The core of the religion is submission to the will of Allah; people must abandon themselves entirely to God's sovereignty. Although as creator Allah is utterly transcendent and not to be compared to any of his creatures, he is nevertheless a personal God, a fair judge, merciful and benevolent. Each chapter of the Quran begins with "Allah, the Merciful, the Compassionate," and before fulfilling religious obligations the Muslim recites, "In the name of Allah, the Merciful, the Compassionate." Islam does not admit of any mediator between Allah and humans; a person approaches Allah directly in personal prayer and in reciting the Quran, which is considered literally the speech of Allah. The prophets, who conveyed the word of Allah, are not considered in any way divine. As noted, the name Allah is used by self-professed Arab Christians throughout the Middle East. It is also used by Arabic Jews, especially those residing in Yemen. According to the Quran the authority of the Torah and the Gospels is subordinated to the content of Muslim revelation. It was regarded by the "prophet" Muhammad that both, the Jewish and Christian scriptures, were "corrupted" (from the Arabic term: Tahrif). Accordingly, since the Quran has remained unaltered to the present day, (compared to the other Scriptures) Muslims assert that only the Quran contains the Words of God -- the truth in toto (i.e., the whole truth and nothing but the truth). Whereas the earlier Scriptures/Books such as The New Testament, The Old Testament, etc. contain only partial truths. Christians believe in the mystery of the Trinity (Father, Son, and Holy Spirit), but Muslims don't. In the Quran's Surah 13 it is said: "Allah is the Creator of all things: He is the One, the Supreme and Irresistible." "To believe that Allah Ta'ala is One. That He has no partner, no father, mother, wife and so has no son or daughter; and that there is nothing else that is worthy of praise, or worship except Him -Alone and to equally testify that Muhammed (S.A.W.) is His servant and messenger. "This Kalimah is simple and can be uttered in a few sentences which can easily be pronounced by anybody without much difficulty. "La ilaha Illa Allah Muhammad Rasulu llah" (SAW). Meaning: There is no deity worthy of worship except Allah and that Muhammad (S.A.W.) is the messenger of Allah." Consequently Allah is unique, is the "God" in Islam, and according to Marshall G. S. Hodgson, (The Venture of Islam) Muslims are worshiping Allah rather than God, the creator. From the 112th Surah of the Quran: "In the name of God, the Merciful, the Compassionate. Say (O Mohammad) He is God the One God, the Everlasting Refuge, who has not begotten, nor has been begotten, and equal to Him is not anyone." In Surah 19:88 of the Quran we read: "Those who say: 'The Lord of Mercy has begotten a son,' preach a monstrous falsehood, at which the very heavens might crack, the earth break asunder, and the mountains crumble to dust. That they should ascribe a son to the Merciful, when it does not become the Lord of Mercy to beget one!" God's Son came in the form of man, a truth called the incarnation (Luke 1:30-35; John 1:14; Colossians 2:9; 1 John 4:1-3). The Lord Jesus Christ conquered the penalty and power of sin by dying on the cross (Romans 6:23). After rising from the dead, Jesus went back to heaven to be with His Father and sent the Holy Spirit to believers (Acts 1:8-11). One day, Christ will return to judge and rule (Acts 10:42, 43). Those who have trusted in the Lord Jesus will live with Him, but those who refuse to follow Him must be separated in hell from the holy God. So, do Christians and Muslims worship the same God? Definitely no. A better question is, "Do Christians and Muslims both have a correct understanding of who God is?" To this question, the answer is definitely no again. Because of crucial differences between the Christian and Muslim concepts of God, the two faiths cannot both be true. The biblical God alone addresses and solves the problem of sin by giving His Son. "For God so loved the world that he gave his one and only Son, that whoever believes in him shall not perish but have eternal life. For God did not send his Son into the world to condemn the world, but to save the world through him. Whoever believes in him is not condemned, but whoever does not believe stands condemned already because he has not believed in the name of God's one and only Son" (John 3:16-18). The true religion cannot have blatant illogic at the heart of its teaching. Islam has blatant illogic at its heart. Islam considers Jesus to be a prophet, but it denies that He was God. Islam and Allah says that God had no Son and it repudiates the Trinity. The illogic is this: Jesus said and indicated that He was God many times (e.g., John 8:58). He also indicated that he was the Son of God (e.g., Matthew 16:13-17); even God the Father testified to this truth by His own words (e.g., Matthew 3:17; Matthew 17:5). On this point one can also consult: Where does the Bible teach that Jesus is God? If He was not God or the Son of God (as "Allah" and Islam claims), then He was a false prophet for claiming to be God and the Son of God when He was not; and God the Father was a liar for claiming to have a Son when he did not. According to Islam, Jesus would logically – and we say this for the sake of argument for those who, God forbid, might accept Islam as true – have to be considered a blasphemer and a false prophet; and God the Father would logically have to considered as a false God and a liar. Jesus could not logically be considered a prophet; and God the Father could not logically be considered as God. That proves that Islam is a false religion and that Allah is not "God" but in fact the Devil and that it has an official teaching which is blatantly false and illogical. It proves it without even getting into the other false teachings of Islam which demonstrate that it's a false religion which was inspired by the enemy of mankind to lead souls astray.